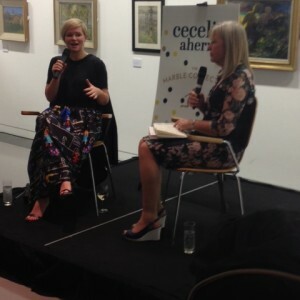 It’s always a pleasure to meet Cecelia Ahern. From the time we first met, after the publication of Ps I Love You, through various other interviews and book events over the years, I have always adored Cecelia. She’s funny, bubbly, gracious, and always amazing to her fans. When she won her category at the Bord Gais Energy Book Awards last year, her joy, winning on her eighth nomination, was clear to see. She was buzzing! So when I was asked to interview her in public, on 12th November, at an event in to talk about her latest novel, The Marble Collector, I was delighted! And we had a lovely time in the glorious Royal Hibernian Academy, talking about father and daughter Fergus and Sabrina Boggs, marbles, memories, parenthood, and, of course, awards! With a ninth nomination, Cecelia is hoping she might win her category at the BGEIBA again this year and make it a double. The place was full of her fans, and they all had a chance to chat to their favourite author, get their books signed, and have a photo taken with her.